If you’re buying a home in Oakland, here’s some advice from our Oakland electricians. 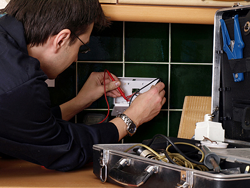 During the buying process you should be looking closely at the wiring and electrical systems. Even though a general home inspector may be of help in determining the structural soundness of the home, he may not be well versed in the ins and outs of electrical service. Because most mortgages require a home inspection by a licensed inspector, you’ll need to get one, but you need to make sure that you get a full inspection. Our Oakland electrical contractors are there to fill this important gap of knowledge and make sure your electrical systems are in working order and if not, how much it will cost to get them there. When buying any new home, you’ll want to know what if any defects there are, or safety hazards. Items that rate high on the list are things like aluminum wiring, GFCI receptacles, grounding and water leaking into service parts. The two of these that are most critical, dangerous and expensive are the aluminum wiring and water leaks into the main service. If you are just moving into a home you purchased, there are some things you can do to be sure your Oakland electrical system is safe. We highly recommend that all these devices be changed to new ones. This would be all the switches and receptacles. 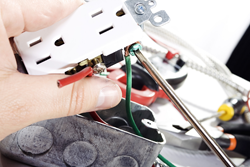 Because the majority of electrical problems occur when termination points become loose or corroded, updating your plugs and switches is the most sensible catch-all option for preventing electrical damage to your electronics, appliances, and house, all at once. It’s also one of the least expensive, both in terms of prevention and in terms of the damage it can prevent. The other item to consider changing is light fixtures. This can be a bit expensive so if it isn’t in your budget try to at least change the very old ones. The reason for changing these is older fixture wires tend to get very brittle. If the bulbs used in them over the years were of an improper wattage, they may have corroded even faster.This is also an excellent opportunity to replace any incandescent bulbs with high-efficiency CFLs, which can both help keep your sockets working for longer and lower your monthly energy usage. The peace of mind you will get, knowing that a qualified Oakland electrician has deemed your home’s electrical system to be safe, is well worth the money spent.